Selling: Easy as 1, 2, 3! Earn cash for your clutter! Just Between Friends St. Cloud provides you with a venue and thousands of shoppers looking at your items during the sale! Consigners earn 60% on their sold items. We have a $15 consignor fee to help with advertising and man power during the sale! Donating your items reduces your consignor fee to $10, and many volunteer shifts waive it all together! You set your own prices! Our convenient tagging system is available to you 24/7. You choose when and where it is easiest for you to tag and prep your items. Consigners get to shop early! Kid's don't stop growing! 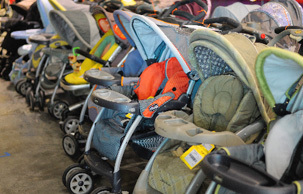 Sell their outgrown items, and get first pick on finding new ones! How can you earn even more?! Help at the sale! Volunteers can earn up to 70% on their sold items! Many volunteer shifts will even waive your consignor fee! Reduce and Donate! Studies show that consignors that choose to reduce their items for our discount days, and donate their unsold items after the sale, sell 20-30% MORE! Watch this video to learn more! No time to tag? Let us help! Check out our Valet Tagging program below! Just Between Friends St. Cloud can't make our sales happen without the help of our amazing Team Members and Volunteers! Helping at the sale can earn you up to 70% of your sold items and many shifts qualify you to have your consignor fee waived! We break down our shifts so you can choose what fits into your busy schedule best! Check the TEAM MEMBER box and it opens the online scheduler to choose a shift. Note! You must be a Consignor to register. Haven't consigned before...it's a great time to start! 4 hour volunteers: Must work a minimum of 4 hours during the sale (or shifts that qualify for 4 credits). Earns 65% of their sold items. Shops Pre-Sale at 2:00pm on Wed 3/27 and Half Price Pre-Sale at 5:00pm on Sat 3/30. 8 hour volunteers: Must work a minimum of 8 hours during the sale (or shifts that qualify for 8 credits). Earns 70% of their sold items. Shops Pre-Sale at 1:30pm on Wed 3/27 and Half Price Pre-Sale at 5:00pm on Sat 3/30. 12 hour volunteers: Must work a minimum of 12 hours during the sale (or shifts that qualify for 12 credits). Earns 70% of their sold items, and has their consignor fee waived. Shops Pre-Sale at 1:00pm on Wed 3/27 and Half Price Pre-Sale at 5:00pm on Sat 3/30. What to Bring & Wear: Please bring any food or drink that you might need during your shift. Wear comfortable shoes and clothing. High Volume Consignors: Consignors who bring 500 items or more are REQUIRED to help at least 4 hours during Breakdown. Consignors who bring more than 200 items are HIGHLY encouraged to help during Breakdown. You will check in and drop off your items off using our service door outside Crossroad's Center, between Macy's and the Mall entrance by Target. Read over your Consignor Waiver before dropping off. Drive to the drop off entrance at the back of the store between Macy's and Target, signs will be up to direct you - a friendly Team Member will greet you & help you get checked in! You will place your items on the sales floor after they are inspected (plan for about an hour). Pick up your Presale Tickets and be ready to shop 'til you drop! Kids are welcome during all Presale shopping times. Please use caution as the Presales can be crowded and overwhelming. Children must be closely supervised and stay with the parent at all times. Mon 4/1 at 4:00pm-6:00pm - Any item left at the sale after 6:01pm will be donated to our local charity partner. Sorry, NO EXCEPTIONS! After the event, you may donate your unsold items to our charity partner, A Place of Hope OR pick up your unsold items. If you donate items, you will be helping our local community + receive a donation slip for tax purposes with your check. Pick up will be on Mon 4/1 at 4:00pm-6:00pm or you can help with the Sort Shift and bring your items home after sorting is finished. Pick up is totally painless as all items are sorted for you (how cool is that?). You can be in and out quickly! 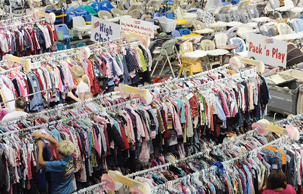 • Any items that were pulled from the sales floor during the event (stained, broken, recalled or missing a tag) will be organized on tables/racks to look over and collect as a part of the pickup process. After pick up, all remaining items are donated to our charity partner. Sorry, no exceptions! Bring your best! Be selective with the items you choose to consign. Remember, we inspect items to benefit both you and our shoppers. JBF has a reputation of offering a quality sale to the community. Price to sell! Best priced items sell first. Price about 50-90% off what the item sells for in the stores, keep in mind the brand and condition of the item. Don't be afraid to review and lower the prices on your unsold items before the next sales event. Secure all loose items and accessories! We can't sell an item without all of its pieces attached, so make sure any loose items are securely attached. We recommend using zip ties, tape, and baggies to help keep items together. Participate in discount days! Consignors that reduce their items sell on average 60% more than those who don't! That's because their items are usually priced to sell, and shoppers take a second look at them on Half-Price day. Volunteer! Consignors that volunteer add more money to their check and get to shop first! It's an opportunity to meet other budget savvy parents in your community and learn more tips and tricks to be a superstar consignor along the way! Promote each sales event within your circle! On average it take 10 shoppers to sell 1 consignors items. Make sure you share the event at your child's school, daycare, church, work, sporting events, and anywhere else you can think of! Hand out flyers and free admission passes, share the event on Facebook, and participate in our consignor referral program. Stained, dirty, and torn clothing. Items that have been recalled - many items have recall repair kits, check the manufacturers website. Used underwear - training pants up to size 4 are okay. Women's clothing/shoes - Remember Junior's clothing is in ODD sizes (ex. 3-5-7-9-11). While JBF accepts juniors clothing in current styles/brands, we do not accept women's clothing. JBF St. Cloud is currently NOT accepting any Mommy Mart items. No Time? Don't Toss It! Try our Valet Tagging Services! We take the workload off your hands! We prep & price your items and bring them to the sale for you! You gather your items, make sure clothing is freshly laundered and toys are in working order with all their pieces. Drop them off with one of our experienced Valet Taggers. Sit back and watch the money roll in! You make 50% of your sold items! Want to earn more? Volunteer to help during a sort or breakdown shift and earn 55% on your sold items. Valet Consignor spaces are limited and will close when spaces fill. Email Samantha to find out how you can reserve a spot! Check out our Valet Waiver for all the details. Consignors that choose to REDUCE & DONATE sell an average of 85% of their items! As an added bonus, we will drop your consignor fee to $10! Watch this video to learn even more!